The “Track a revenue opportunity” activity is great way to manage your sales activity and keep an eye on the qualified deals. As with all Solve activities, opportunities include a standard set of fields, that include a default set of options. 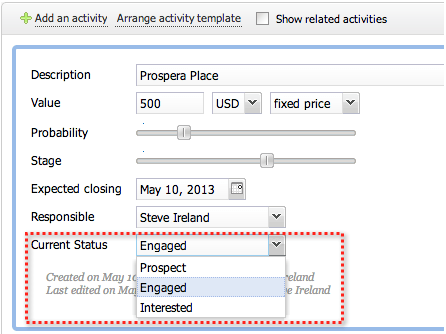 Clients can now customize the opportunity’s Status field options. To do so, your Solve administrator opens Solve Menu > Customize Form Fields > Editing Opportunity fields > Add a field > Standard fields > Status. The Status field will now appear on the form designer where the field’s label and options can be changed. The custom status options override the standard ones that are provided by default. The custom status settings are reflected on the opportunity itself, along with the “Report and Update Activities > Show Opportunities managed by” and the Google Apps Revenue Opportunity report. If the custom status field is removed the status options will simply revert to the standard default ones.